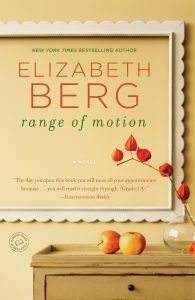 I’ve been an avid fan of Elizabeth Berg’s novels ever since the early 1990s when I read RANGE OF MOTION, the story of Lainey and her husband, Jay. Jay lies in a coma after a head injury and the doctors have given up on him but Lainey hasn’t and won’t. She talks to him as though he hears every word. She brings things for him to feel, hear, and smell and she waits every day for a miracle that she has been told will never come. I adored this book and went back and read Elizabeth’s early novels and haven’t missed one since. Imagine my delight, years later, when I got to meet Ms. Berg at the Iowa City Festival of Books where we were both presenting. As I expected, Elizabeth was warm, sincere and funny and remains one of my writing idols. 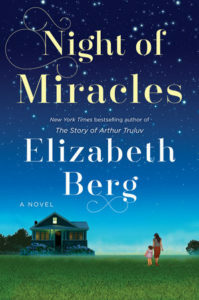 In Elizabeth’s newest novel, NIGHT OF MIRACLES, Lucille Howard is getting on in years, but has begun to teach baking classes, sharing the secrets to her delicious classic Southern yellow cake, the perfect pinwheel cookies, and other sweet essentials. When a new family moves in next door and tragedy strikes, the residents of Mason, Missouri come together and find the true power of community—just when they need it the most. Today, she generously shares with us some fun tidbits about her favorite books and what she has next for readers. What’s your favorite book from childhood? Beautiful Joe by Marshall Saunders. It’s a dog story, from the dog’s point of view. Made me cry my eyes out. I must have read it one hundred times. Favorite beverage/snack while you read or write? Anything carbohydrate. What book would you like to be a character in? Carson McCuller’s The Member of the Wedding. Who is your writing heroine/hero? Alice Munro. Never a bad sentence. NEVER. What’s your favorite genre to read in your free time? Literary fiction and poetry. I also like essays. And memoir. How do you organize your home library? Badly. Very badly. Can you come over and help me? Anyone? Anyone? I do have nonfiction downstairs, everything else upstairs. After that, it’s a mess. Saddest book you’ve ever read? See number one. Scariest book you’ve ever read? I don’t normally like scary books (especially now, when real life is so scary) but long ago I read Stephen King and he scared the bejesus out of me. Name a book you can’t get out of your head? Bookshop of the Brokenhearted by Robert Hillman, due out this spring. I also hold on to Anne Tyler novels. Where is your favorite place to read? In bed. Where do you do your writing? In my office, a converted bedroom. I look out onto the street, so I can see all the dogs go by. What is your favorite past time? Being with my grandchildren. Reading. Cooking and eating. Petting dogs. Sewing. Going to funky resale shops and fabric shops and kitchen stores and Anthrolologie stores. Last but certainly not least, car trips across the country. If you could meet one writer ~ living or deceased ~ who would it be? Living: Alice Munro. Dead: E.B. White. What book is on your bedside table right now? Oh Lord. There are at least twenty-five books on my nightstand. A mix of cookbooks, fiction, non-fiction, poetry and short stories. Currently focused on My Abandonment by Peter Rock, Ann Hood’s Kitchen Yarns, Conversations with Friends by Sally Rooney, and the poetry of Barbara Crooker and Ted Kooser. Getting ready to read book five of Karl Ove Knausgaard’s My Struggle. I loved the first four. What do you have coming next for readers? I just finished the third book featuring the town of Mason, Missouri. The Confession Club will be out sometime this year. It’s a fun one! 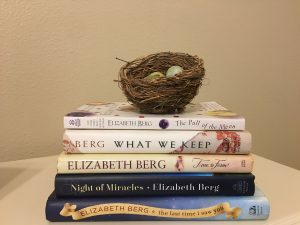 Elizabeth Berg is the author of many bestselling novels, including THE STORY OF ARTHUR TRULUV, OPEN HOUSE (an Oprah’s Book Club selection), TALK BEFORE SLEEP and THE YEAR OF PLEASURES, as well as the short story collection THE DAY I ATE WHATEVER I WANTED. DURABLE GOODS and JOY SCHOOL were selected as ALA Best Books of the Year. She adapted THE PULL OF THE MOON into a play that enjoyed sold-out performances in Chicago and Indianapolis. Berg’s work has been published in 30 countries, and three of her novels have been turned into television movies. She is the founder of Writing Matters, a quality reading series dedicated to serving author, audience and community. She teaches one-day writing workshops and is a popular speaker at venues around the country. Some of her most popular Facebook postings have been collected in MAKE SOMEONE HAPPY and STILL HAPPY. She lives outside Chicago.